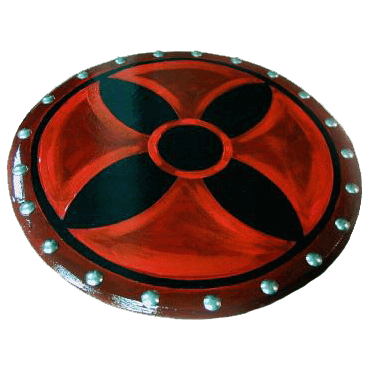 This shield features a Vampire Cross design that has been painted in deep red and crimson hues almost like congealed blood. The Wooden Vampire Cross Shield has been completely hand crafted and hand-painted. The Vampire Cross shield is made out of a smooth composite wood which is slightly stronger than plywood. Stainless steel studs line the border and dual leather straps are used to comfortably secure the arm along the backside. The wooden shield measures over 20 inches in diameter and has been sealed with several coats of varnish to protect the design from wear. Whether for backyard brawling or for simple wall-hanging, this shield will suit your needs wonderfully.